Scientists have warned of a new plague of jellyfish to hit Spain this summer. The Guardian here reports that scientists were “alarmed to detect large numbers of the Pelagia noctiluca, commonly known as the “mauve stinger”, growing in the winter”. 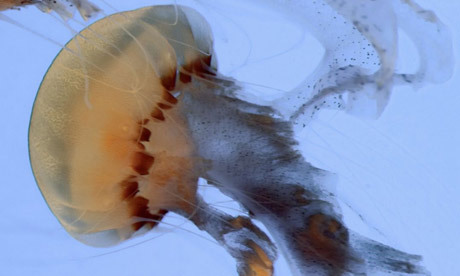 ..A study has revealed that jellyfish proliferate throughout the year, not just in the summer. Between November and January, scientists discovered 30 colonies, or blooms, ranging in size from four to 10 jellyfish per cubic metre of water, all along the Catalan coast. “The problem seen on the beaches is not the main concern for scientists….Jelly expert Professor Gili, noted “For us the major worry is the global disequilibrium in the sea caused by over-fishing.” In 2006, the Red Cross treated 21,000 people who had been stung on the beaches of Catalonia, while on a single day in August, 400 bathers were treated at a beach in Málaga. One cause of the problem is the decrease in leatherback turtles, a principal predator, which have been driven to the point of extinction because the beaches where they lay eggs have been used for tourism.